Astrodon 6 nm H-a and OIII. R=H=a; B = G = OIII. 6 min each R,G,B. This object is the faintest that I have imaged. SIMBAD lists it as B-V mag 15.6.. 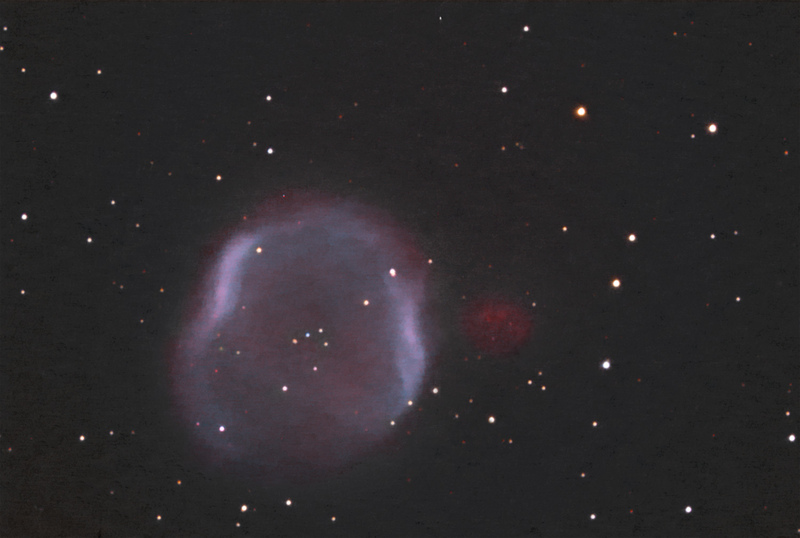 The net H-a ADU after 15 min exposures with the high QE of the KAF3200ME CCD in the ST10XME was <100. This object is about 5′ wide in Andromeda. North is to the left. There is an "L-shaped" asterism in the center of the nebula, with the blue proginator star clearly shown. Notice that there is an H-a-rich region to the right of the main nebula that did not have OIII. Otherwise known as WD 2333+310 at RA 23 35 53.3 Dec +30 28 06. Reference to Palomar Observatory Sky Survey (POSSI) click here. This POSSI image also shows the extended H-a region to the south.